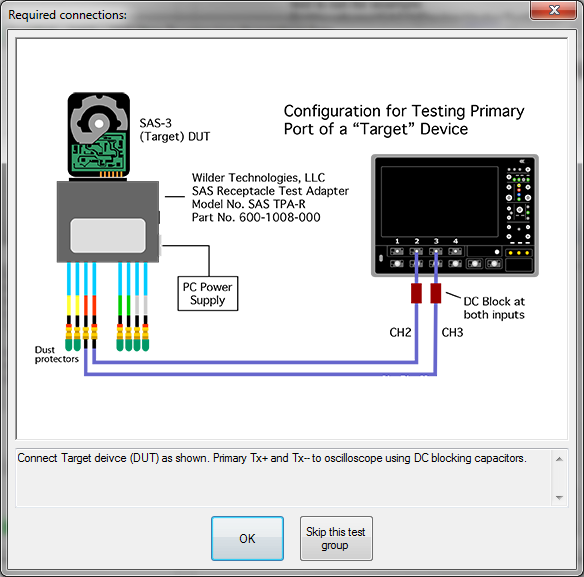 The QPHY-SAS3 Test Solution provides automated control of the SDA 8 Zi-A and LabMaster 10 Zi oscilloscopes for performing all of the transmitter physical layer tests as described by the T10 SAS-3 specification. This specification covers targets and initiators running at 1.5 Gb/s, 3.0 Gb/s, 6.0 Gb/s, and 12.0 Gb/s. Serial Attached SCSI (SAS) is the serialized version of the popular SCSI standard. SAS is primarily used for server class storage at speeds of up to 12 Gb/s. QPHY-SAS3 covers tests from Group 1 (TX OOB Signaling and AC Coupling Requirements), Group 2 (TX Spread Spectrum Clocking (SSC) Requirements) and Group 3 (TX NRZ Data Signaling Requirements) of the test specification. Additionally, QPHY-SAS3 supports the required SAS3_EYEOPENING measurements. These capabilities make QPHY-SAS3 an all-inclusive automated test suite that meets the requirements for 1.5 Gb/s, 3.0 Gb/s, 6.0 Gb/s and 12.0 Gb/s SAS transmitter compliance testing. OOB validation ensures that the maximum noise during OOB idle, OOB burst amplitude, OOB offset delta, and OOB common mode delta are all within the specification limits. SSC validation requires long memory and specialized analysis functions. QPHY-SAS3 can precisely track SSC profiles through multiple cycles in real time. 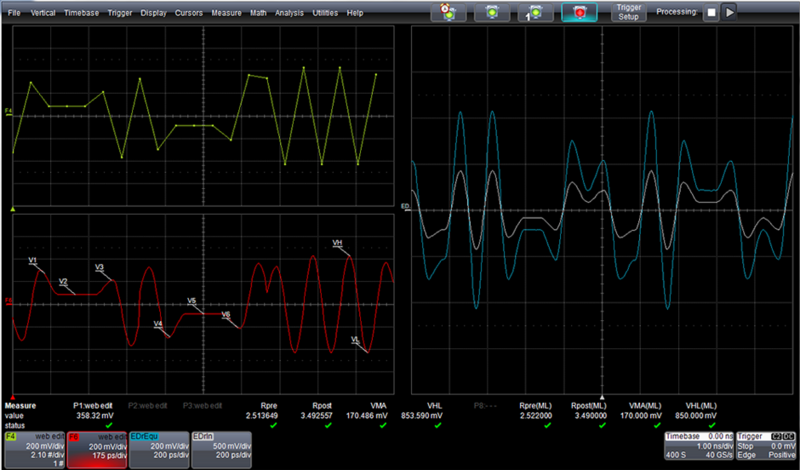 SSC modulation frequency, deviation, balance and DFDT are all measured. Tx Emphasis measures precursor equalization ratio (Rpre), postcursor equalization ratio (Rpost), VMA, and VHL using the SAS3_EYEOPENING script. The use of Spread Spectrum Clocking (SSC) in transmitted signals is an optional feature of the SAS-3 specification. When SSC is enabled, measurements such as frequency modulation rate and deviation must also be verified per the specification. 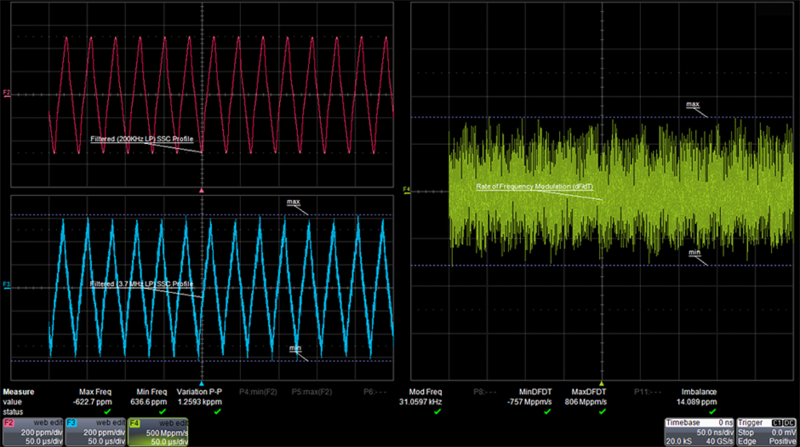 The QPHY-SAS3 software works in conjunction with the deep memory and powerful analysis library of Teledyne LeCroy oscilloscopes to greatly simplify this verification process. Clock recovery circuitry and clock extraction via Phase-Locked Loops (PLLs) is another significant design consideration. Flexible clock recovery options allow for the replication of virtually any real receiver PLL configuration enabling the simulation of “what if” scenarios. Jitter results can be measured exactly as the receiver would see them. 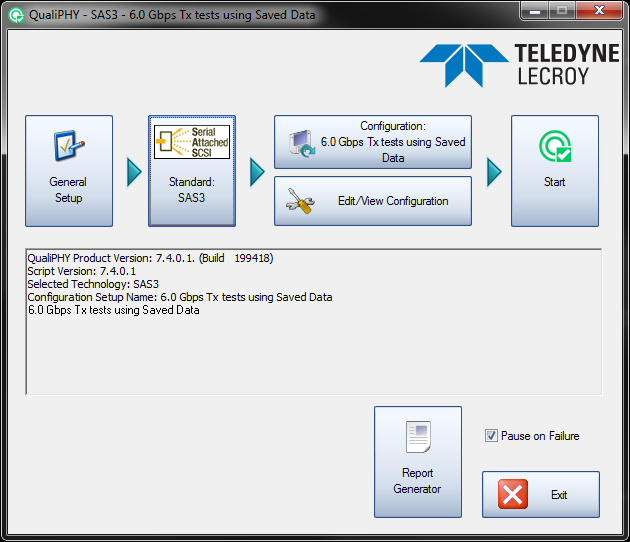 If a compliance failure is found, Teledyne LeCroy’s SDAIII-CompleteLinQ serial data analysis package is available to help find the root cause quickly and easily. 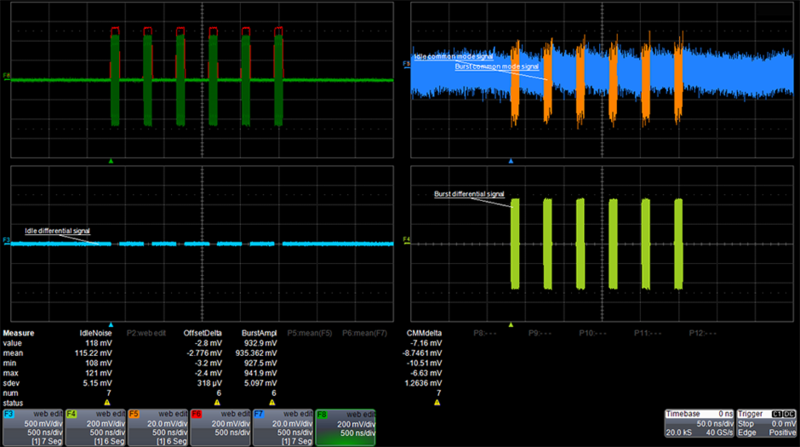 SDAIII-CompleteLinQ has the ability to perform Eye and Jitter measurements on up to four lanes and is fully integrated into the oscilloscope application software. In addition, the software includes tools that provide insight into Eye and Jitter parameters making it easier to identify sources of problems. SDAIII-CompleteLinQ includes simultaneous multi-lane serial data, eye, jitter, noise and crosstalk analysis, and integrates the Eye Doctor II toolkit for equalization and channel/fixture de-embedding and emulation. 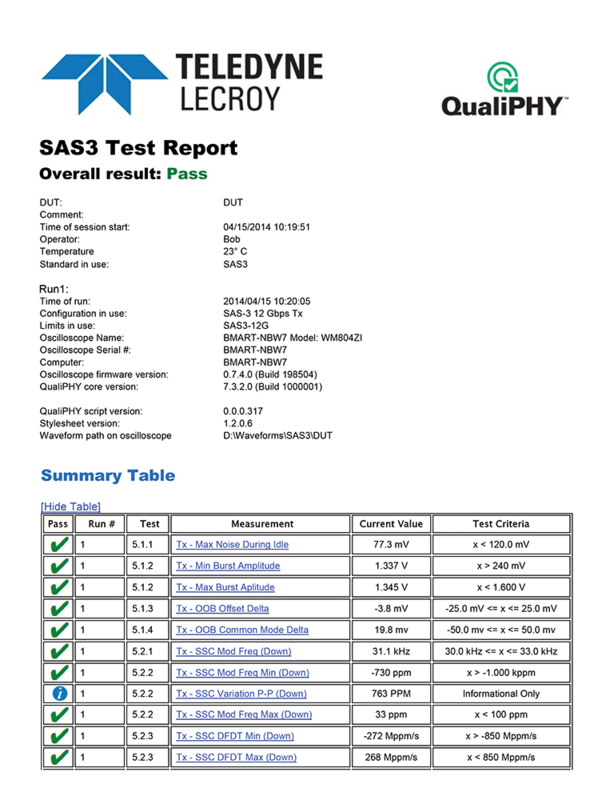 QualiPHY is designed to reduce the time, effort, and specialized knowledge needed to perform compliance testing on high-speed serial buses. QualiPHY helps the user perform testing the right way—every time!